Lavender (or it scientific name lavandula) is probably one of the most versatile herbs you can grow. It is also one of the most fragrant and certainly one of my favourites. Nicknamed ‘first aid in a bottle’ lavender does not only have a soothing sort of smell and an enchanting look, but this mint family plant, has been used medicinally, for over 2,500 years. The scent of this plant seems to distract mice and mosquitoes and yet it is commonly used in potpourris, strange! It is just as well we’re not all the same! Bees love the lavender plant, especially its nectar which produces high quality honey. We shall talk about this another time. 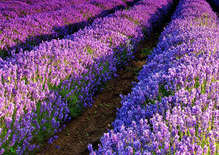 The oil from the lavender helps to soothe aching muscles and has been found to reduce stress and anxiety and aid sleep. When I had my own herb farm, some years ago, I made and sold lavender bags to many an insomniac! In Elizabethan times, lavender was used to perfume bed linen as baths weren’t a common practice then. The mind boggles, does it not? And during the great plague which hit London, bunches of lavender were often seen tied to people’s wrists to fight off infection and bacteria. And there is such a thing as the language of flowers. For example, some people believe that lavender can mean devotion, happiness, success and luck. I’m not quite sure I believe all that. But I do know that lavender is a plant that I’m happy to have growing in our garden for waifs and strays. I also use it in cooking on occasions.